Dolphin Heart Reiki is a healing system developed by Shanti Johnson that uses sight, sound, color, light, and the essence of water to lull you back into your womb like state and become the dolphin essence that once was yours. This is the way to truly connect heart, mind and soul back to ancient rhymes, and times, using sound, color, sensation and delight! This system activates your High Heart Chakra. It brings toward you all the ancient truths for yourself, and humankind. The High Heart Chakra governs what you truly feel, heal, and think with, yet humankind has gotten away from this type of expression, therefore it is rarely used in our culture. This is why the Celestial Dolphins have come down to gift us with this form of healing. The extensive manual includes many explanations, descriptions, pictures meditations, chants, and exercises for ongoing use in working with the celestial dolphins. This is a beautiful manual with wonderful artwork. 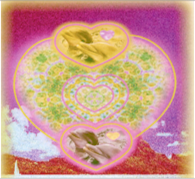 Included in this system are two attunements, one to the Pink Dolphins and one to the Gold Dolphins.